What is art song? A quick definition: poetry set to music for classical voice and piano. Yes, there are art songs with orchestra etc., but that will do for a beginning. You already know at least one art song, Brahms’ Lullaby. The first verse is taken from a collection of German folk poems called Des Knaben Wunderhorn; the second stanza was written by Georg Scherer (1824 – 1909) in 1849. .
Lotte Lehmann was renowned for her Lieder interpretations, but what does the word Lieder mean? It means simply German art songs. Here’s art song’s brief description: a poem set to music, usually for trained voice and piano with a duration of about three minutes. Other English words are solo song, art-song, artsong, classical song, piano song etc. In German the word for such classical song is Lied (singular) and Lieder (plural). It is the German practice to capitalize their nouns. But this concise definition really doesn’t touch the soul of Lieder. The elements (a quartet if you like: poet, composer, singer and pianist) work together, each complimenting the other. Many scholars have suggested that really great poetry shouldn’t be set as song; it should stand on its own merits. And it is certainly true that epic poetry is seldom set to music. But lyric poetry, of whatever language, has inspired composers right down to our own times to set and even enhance a poem, often making it more accessible, highlighting elements that only music can. Lyric poetry tends to be short, concise, often deals with love, nature and other elements favored by the Romantic artists of the 18th and 19th Centuries. But though Lieder may have reached a climax in expression, appreciation and perfection during the 19th Century, art song is indeed still being written, performed and recorded today. In fact, this may be seen as another golden age of art song performance because it has become too expensive to record operas, thus many gifted singers record art song recitals instead. There is a perceived dichotomy between the “bel canto” (beautiful singing) demands of opera, especially those of Bellini, Donizetti and Rossini, and the intimate, word-centered requirements of Lieder singing. For example, the Danish soprano Povla Frijsh (1881 – 1960) wasn’t blessed with the most beautiful of voices, but had a successful career as a recitalist because of the subtle way she could handle the demands of songs. Here it may be mentioned that not all opera singers are successful Lieder singers and vice versa. Let me quote J.B. Steane’s “The Grand Tradition” where he writes of Lehmann: “She was able to a remarkable extent to sing opera with the intimacy of a Lieder singer, giving out a glorious stream of voice, yet attending imaginatively to the enunciation and coloring of the text….There surely never was an operatic artist with more of the natural feeling for the ways in which a phrase can be made meaningful and vivid, through the detailed, imaginative care for words.” Taking the other direction, let me quote the conductor Bruno Walter, often Lehmann’s Lieder accompanist. He wrote, “It was admirable how Lotte Lehmann’s dramatic feeling, to which she had formerly been inclined to yield almost to the point where she did violence to her voice, had gradually become restrained to fit the rendering of songs. Amazing, too, that her impetuous elemental personality should have found the way to the stylistic purity of the song by means of her own almost infallible instinct.” Thus you see that there are two distinct approaches to consider: bringing word sensitivity of the Lieder singer to opera, or the restraining of dramatic opera impulses for the recital stage. Lehmann accomplished both. A few terms: song “cycle” is a group of songs, usually by the same poet, that a composer conceives as being sung together. The so-called “Schwanengesang” (Swan-song cycle) of Schubert really wasn’t meant by him to be sung together. These are just the final songs of Schubert’s life that were collected together and published under that title. Good examples of song cycles that Lehmann sang are: Beethoven’s “An die ferne Geliebte” (To the Distant Loved One); Schubert’s “Die schöne Müllerin” (The Beautiful Miller Maid) and his “Winterreise” (Winter Journey). These three are most often performed by male singers, voicing their thoughts of lost or distant love; when Lehmann sings them, she seems to identify with the longing and even desperation which a man in such a position would feel. She is like his muse, his mouthpiece able to express thoughts that he cannot. Lehmann also performed and recorded Schumann’s “Dichterliebe” (Poet’s Love) and “Frauenliebe und -leben” (Woman’s Love and Life). These two song cycles are so successful as a group of songs that it is unusual to hear the individual songs. “Dichterliebe” is another man’s song cycle that Lehmann made very much her own. And I don’t mean that she tried to sound masculine. She was able to probe the meaning of the poet and feelings that are universally applicable to males and females. Lehmann first recorded “Frauenliebe und -leben” in 1928. Unfortunately for that recording it was arranged for instrumental trio and doesn’t allow the singer the rapport that Lehmann enjoyed in performances with Bruno Walter or Paul Ulanowsky as pianists. There are fine recordings of all these performances available on CD. (See the Complete CD List). There is a definite story line here, from the innocent young girl who first sees the man of her dreams, through motherhood and finally the death of her beloved husband. Lehmann is able throughout this cycle to focus on the moment in the story and yet keep the feeling of the whole narrative alive. One moment in the final song stands out as especially poignant, when she sings “der Schleier fällt” (the veil falls) it seems as if she might not be able to finish the song. It is drama like this, taken perhaps from her well-developed stage acting techniques, that enabled Lehmann to breathe real life into such songs. Another term that one encounters in the field of art song or Lieder is: accompanist. Usually that is a pianist. And there is the perception that the pianist is just a voice in the background to support the singer. In good art song this isn’t the case: the composer expects a duet of sorts between the piano and voice. The pianist does provide the chordal significance of the sung melody, but there is an interplay between the singer and pianist on many levels. The pianist may set the scene (as in an introductory section) or compliment on the piano what the singer does with the voice. Robert Schumann also used extensive postludes to sum up the thought of the poem. By the careful use of dynamics (loud and soft) the pianist can focus attention on dramatic moments or the intimate ones. The pianist (accompanist) must know the words of the poetry as well as the singer’s notes. (We’ll assume the pianist has learned his/her notes!). Sometimes the composer’s point of view towards the poetry is expressed in the piano part. Often elements of nature (water, storms, wind etc.) are written into the piano music. Lehmann worked mainly with four pianists: Ernö Balogh, Paul Ulanowsky, Bruno Walter (most famous as a conductor) and Gwendolyn Koldofsky. There are recordings available of each of these cooperative ventures. Though these pianists were art song specialists, early recording techniques allowed only one horn or one microphone to pick up the two artists and the true duet between the artists has been diminished. The horn or microphone was placed near the singer and thus the piano can sound like a light tinkling in the background of many Lehmann and other early recordings. But one thing you can hear in these old recordings: Lehmann frequently used rubato (the speeding up and slowing down within a phrase) which all her accompanists learned to anticipate. Let’s look specifically at Lehmann’s art song career. 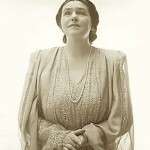 She began singing recitals in Hamburg and Vienna, and was soon invited to sing recitals during the Salzburg Festivals. But her Lieder recordings made in Germany were often marred by salon orchestra accompaniments, poorly played. There is beauty, a real bloom and freshness, in Lehmann’s voice in the 1920’s and 1930’s and close attention to the recordings (mentally filtering out the corny accompaniments) will be repaid by the enjoyment her tone color painting of the poetry and her obvious love of the music. She was a poet herself, which you can read on this site. Few singers have such a deep understanding of the overall meaning of the poems they sing, as well as the ability to color the individual words with the feeling inherent in them. There was a kind of renaissance of Lieder singing in the 1930’s. Lehmann was in the august company of other Lieder performers such as Elisabeth Schumann, Heinrich Schlusnus, Tiana Lemnitz, Gerhardt Hüsch, Elena Gerhardt, Karl Erb, Alexander Kipnis, and Lula Mysz-Gmeiner. Though many of these singers are almost forgotten today, their recordings deserve careful listening. Returning to Lehmann’s Lieder career, it is interesting to note that away from Germany and Austria, her American recordings finally became that combination of piano and voice that composers had in mind when they wrote their songs. Though there was still only one microphone, and this placed close to Lehmann, the artistic result is far more satisfying. In the Discography you’ll be able to trace the various Lieder recordings that Lehmann made and hear the definite artistic growth. Lehmann spoke of having been blessed with three careers. They overlapped: during her first career in opera she early on began performing and recording songs. After her retirement from opera she concentrated on song and began teaching. Finally, after her farewell appearances in 1951, she stopped singing and only taught. (For more information on Lehmann biographical matters, click on the bios). In the US Lehmann’s fame after the WW II was as a Lieder performer. (Actually during the war, she continued to sing German Lieder, which she herself found remarkable. Even at war with Germany, Americans recognized the value of this music and didn’t forbid it. Of course, Lehmann also had the advantage of her anti-Nazi stance). Lehmann’s active touring career in the mid to late 1940’s compelled her to broaden the range of her repertory. She included French “mélodie” (the parallel word for Lieder), English and American songs. Lehmann possessed a natural feeling for French composers and the language. Her spoken English always had a charming, strong accent so it is understandable that her sung English was less successful. But she definitely knew what the words meant, as one can hear in her recording of Haydn’s “She Never Told Her Love” or Irving Berlin’s “God Bless America”. When Lehmann sings the word “God”, the word is strongly and appropriately shaded. 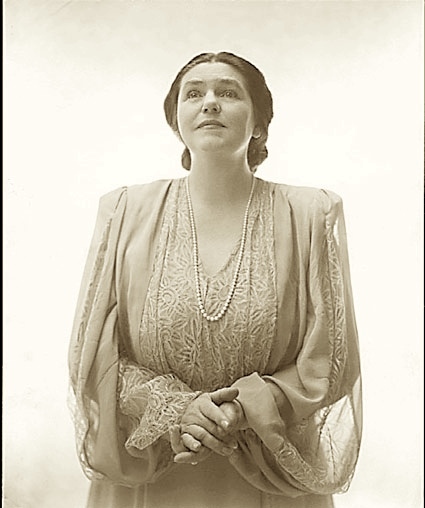 By the time that Lehmann sang her farewell recitals (first in New York City and finally in Santa Barbara) her reputation as a Lieder specialist was without rival in the US. She hadn’t returned to sing in Europe after the war, so her fame there faded a bit. The recordings of two farewell recitals reward attentive listening. All the elements that make for good a Lieder recital are present: even at the age of 63 Lehmann’s voice is still beautiful, if darker; Lehmann knew how to construct a program that included variety, well-known and lesser-known songs; her diction was keen; there’s obvious charisma with the audience that came from her complete identification with every song she chose; her joy in singing is obvious even on the less than optimal recording circumstances; there is complete authority in what she does. There were limitations in breath control and range, but as one commentator put it, to point out such things was the akin to noting that the Venus de Milo has no arms. One overlooks the vocal-technical limitations when Lehmann’s late Lieder recordings touch us so deeply with their emotional meaning; the word painting is clear and the feelings of the poet and composer palpable. At the beginning of this essay on Lieder I mentioned the quartet aspect: first the poet that inspires the composer; the resulting Lied is interpreted by a singer and pianist. The best Lieder singers present a synthesis which at the same time draws no attention to the art involved. The goal is direct communication of tone and word at the same moment.